Stylized version of the original poster. 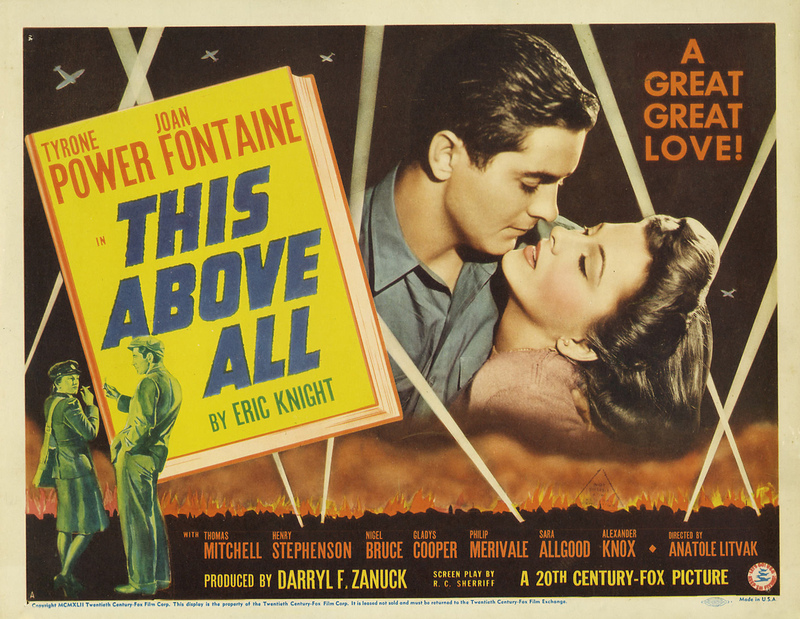 Before I say anything else about “This Above All” (20th Century-Fox, 1942), I want to make it clear that I have a great affection for this picture. Probably far more things are wrong with it than are right or good, but it’s extremely atmospheric and stirring if you’re willing to meet it halfway. It’s full of decency, earnestness, romantic yearning and — this above all — emphatic patriotism. 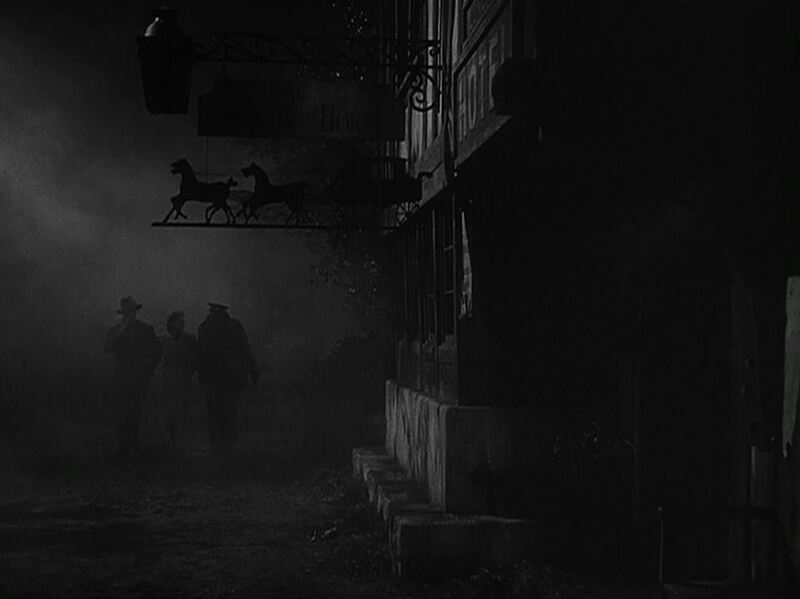 Much of it is well written; all of it is beautifully photographed (by Arthur C. Miller, who was nominated for his work, but lost to Joe Ruttenberg (“Mrs Miniver”)); the story — ludicrous as some of it is — is well-paced by director Anatole Litvak. It’s full of faults, but it’s never boring. Overall, I find it thoroughly entertaining and emotionally satisfying. The title, however, made me approach the picture with considerable trepidation the first time I saw it. I was pretty sure it must be a reference to Polonius’ admonition to his son . . .
. . . but I hoped it wasn’t. Unfortunately, the title is indeed a reference to Polonius’ speech, and it is quoted for the purpose of moral instruction. It comes at the end of the picture, and is underscored by Alfred Newman’s idiotic note-spinning, which is of a genre I call “Choir Celestial Claptrap.” I’m sick and tired of hearing this Shakespearean passage quoted out of context as if it were the Wisdom of the Ages, rather than what it is: perfectly sensible advice, marred by a nonsensical conclusion. * One can quite easily be true to oneself and a cheat to the rest of the world: that’s what villainy is all about. Besides, Polonius is, number one, a humbug, and a scumbag too. It is no wiser to take his advice about personal conduct than to receive moral instruction from Iago. “This Above All” features enough undisguised “We’ve got to win this war — we’ve got to!” speeches to fill a half dozen morale-boosting pictures. (“We’ve got to win this war — we’ve got to!” is, in fact, its antepenultimate line.) The plot is full of borderline ludicrous episodes and accidents, and yet it works quite beautifully if you’re willing to embrace the foolishness. It strikes me as entirely heartfelt and done in a blaze of passion. With few exceptions, little of the acting is first rate, but many of the second raters are better than usual. 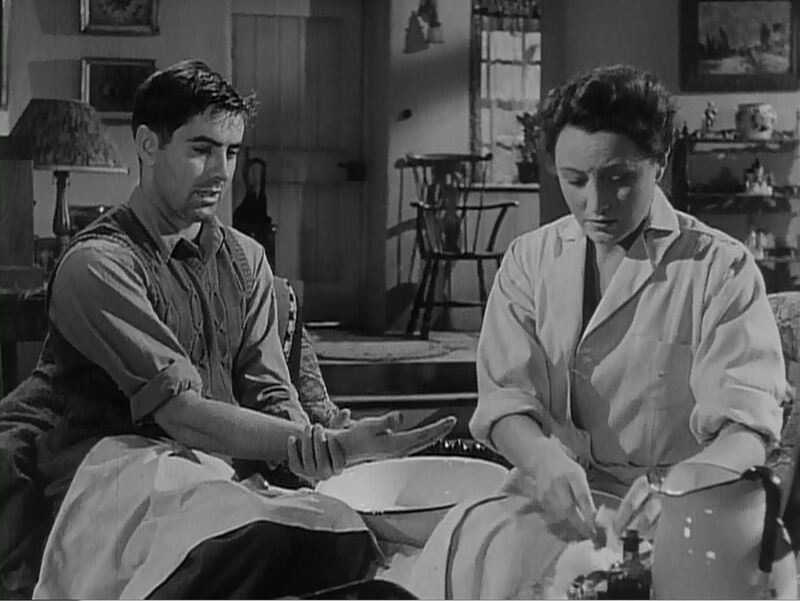 As Joan Fontaine’s father, Philip Merivale is particularly good; so is Miles Mander in a tiny part. The screenplay by R.C. Sherriff is what I like most about it. I find his patriotic bunkum to be of a very high order. His speeches are not nearly as exquisite as Emeric Pressberger’s in “The Life and Death of Colonel Blimp,” but they get the job done. Moreover, Sherriff actually gives the opposition a chance to make a strong case for its side. The opposition will, of course, have to change its mind by the last reel, but not before it has strutted and fretted its hour upon the soap box. This opening scene hooked me at once. It immediately establishes the tone of the movie: it’s the middle of World War II, and the lazy immoral complacency of the Old Guard is vehemently attacked by a latter-day version of the Bright Young Thing — and the Bright Young Thing is in the right. Gladys Cooper, always a welcome old cat, must receive and endure a proper old pasting from a patriotic young beauty. As in nearly every picture Gladys Cooper ever appeared in (with the notable exception of “My Fair Lady”), she is thoroughly in the wrong. The tongue-lashing she receives from Joan Fontaine is wonderfully satisfying. “One day we may look back and thank Hitler for some of the things he’s done to wake us up, but we’ll never look back and thank you!” How do you like the manners of this aristocratic young firebrand? Of course there’s a war on and dear old Albion is fighting for her very life, but does that give Prue the right to compare Miss Cooper unfavorably to Herr Hitler? The first time I saw this scene, the intensity of the rebuke just about knocked the breath out of me. But this is one of the things that makes Sherriff’s patriotism palatable. All through “This Above All,” Sherriff argues that the English class system is riddled with injustice and cruelty: many inequities will have to be put right if the country is to survive. But first, they must all pull together and defeat Hitler. 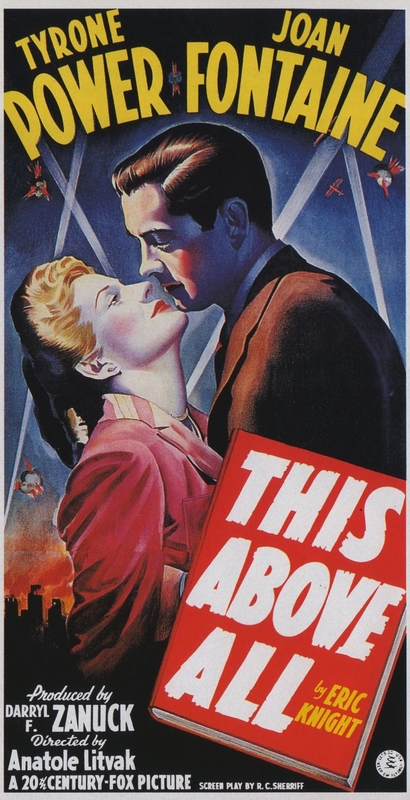 On her first night in WAAF training, Prudence goes out with a friend whose fiancé introduces her to a dark, handsome man of mystery named Clive Briggs (Tyrone Power). The two are simultaneously attracted and antagonistic to each other. And both of them are allowed to be right. Very unusual in a wartime propaganda picture. I wish he were a better actor. He’s much better in the silences: in them, he’s very good. But oh man, those bum line readings of his . . .
And here is how their holiday starts. This sequence is a bouillon cube of the entire picture: it has nearly all of its essential elements: patriotic fervor (hers) and its opposite (his), the dream of romance colliding with the class struggle (theirs), England herself (courtesy of the Fox backlots and Robert Kane’s process shots) . . . and Gladys Cooper, who’s there to be disapproving of the way the improvident world keeps disarranging her table neither with her consent nor to her liking. It isn’t terribly well acted, is it. No, she lets her eyebrows do most of her emoting, while he nearly always sounds as if he were reciting. Yet I find their inadequacies rather touching: the artificiality of her eyebrow acting and his inability to make lines of text sound like conversation strike me as near-virtues with this particular material. Besides, both of them are extremely attractive and they have real chemistry together. She’s better than he is. She does scorn and vehemence well, and she is better than good in the final reel, when things have become quite literally a matter of life and death. And he is good in the silences. Still, better acting would have made for a much better picture: the first time I saw it, I kept wishing Deborah Kerr and Laurence Olivier had played the leads, but there it is — mustn’t grumble. There was a war on. Power and Fontaine part company with Thomas Mitchell. I love the atmospheric lighting. From the “laddies” and “ayes” that pepper Thomas Mitchell’s sentences in this next clip, I take it we’re supposed to believe this proud Son of Elizabeth, New Jersey, is a Scot, but his accent is such a Hollywood Irish stew, it’s hard to know for sure. I have always been allergic to Mitchell’s boisterous, rubicund leprechaun act. He’s perfectly awful: with his face eternally aflame with riot, he reminds me of a fiery Brussels sprout. But it seems that mine is very much the minority opinion. At any rate, in this scene, in which his character provides us with an enormous amount of exposition, he has the twin merits of swiftness and energy. He’s also a bit less sentimental than usual. And I have been careful to end the clip a split second before he begins to roister. 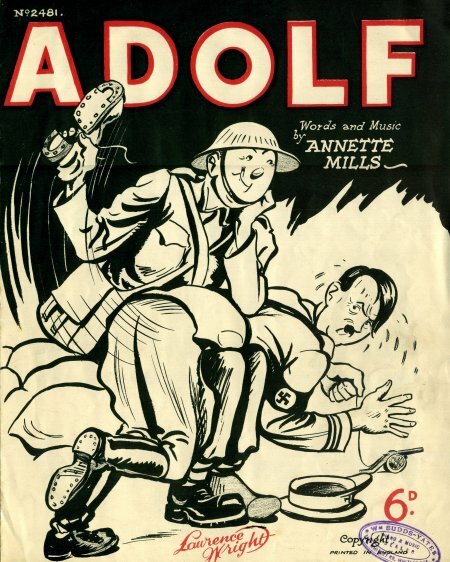 Adolf, you’ve bitten off . . . much more than you can chew. Of the old red, white and blue. We’re sick of all the muddle and the mess you’ve made. So now you’re going to get a big surprise. You’re nothing but a basket full of lies. Words and music by Annette Mills, ©1939. This clip features the most extreme example of back-to-back soap box orations in the whole movie. They both mean what they say, but they’re in over their heads. Poor Joan Fontaine! I’m sure she really does mean every word she dutifully recites; she pulls out all her stops; she changes tempo; her voice goes up hill and down dale; she varies the speed of her tremolo; she employs aposiopesis (Greek: ἀποσιώπησις, “becoming silent”: in oratory, it’s the breaking off of speech to indicate fullness of emotion); she does everything great actors do to ennoble big speeches — but all in vain: she simply doesn’t have the chops to make this sort of thing work. Halfway through, when she lifts her eyes to the heavens and lets the words come cascading out of her in a great frothing curd of sentimentality and ham, it’s almost painful how inadequate she is. She’s working so hard . . . ! I really am touched by her earnestness and diligence. Her pantomime of emotion at the very end, when she executes a hiccough-like facial contortion, eyebrows aloft and working like mad, a sudden widening of the eyes, and finally a little frown just as she buries her face in Ty Power’s chest — pathetic . . . I confess it always gives me a shame-faced chuckle. After this oration, and for the rest of the picture, Tyrone Power is in for a rum go of it — oh, a very rum go. Among other miseries, he seriously injures his hand and must seek the help of a district nurse named Emily Harvey, who patches him up, but tells him plainly that she will have to report him to the authorities. German spies have been reported in the vicinity and she must do her duty. Nurse Harvey is played to perfection by Jill Esmond, who was recently divorced from Laurence Olivier after ten years of marriage. Jill Esmond gives a beautifully restrained performance as Nurse Emily Harvey. Out of context, the rector seems mild enough, but I bristle when he says, “I see you as a symbol of our age — an Age of Reason that’s driven out the Age of Faith.” Quite apart from its being intolerably patronizing, I find it maddeningly wrong-headed for the clergyman to complain that the main problem of living through the Age of Hitler is that everyone is behaving too reasonably. This entry was posted in Main and tagged Alexander Knox, Alfred Newman, Anatole Litvak, Arthur C. Miller, Claude Rains, Emeric Pressburger, Eric Knight, Gladys Cooper, Goodbye Mr Chips, Hamlet, Iago, Jack Jones, James Hilton, James Whale, Jill Esmond, Joan Fontaine, Joe Ruttenberg, Journey's End, Laurence Olivier, Maurice Browne, Michael Powell, Miles Mander, Mrs Miniver, My Fair Lady, Philip Merivale, Phyllis Schlafly, Polonius, R.C. Sherriff, Random Harvest, Shakespeare, That Hamilton Woman, The Invisible Man, The Life and Death of Colonel Blimp, The Old Dark House, The Power of the Positive Woman, This Above All, Tyrone Power, Wives and Lovers on March 3, 2014 by TR.